I considered a 3-phase commercial grade service, which would be really awesome, but it’s probably too big. We only have single-phase coming up the road from the highway, and getting PG&E to run that third wire will cost a small fortune. A “normal” 200-amp residential service will be too small. We don’t have utility gas out there, and instead of having propane trucked in I think I’m going to just go all-electric. That’ll use up the amps pretty quickly. But a class-320 service? That’s just right! 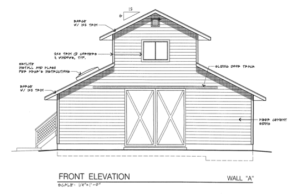 It’s a lot larger than I need for the barn by itself, but I’m Super Sizing it with the intent that it will also serve the cabin I’m going to build, and someday a larger house as well. There’s a county code requirement that certain types of accessory buildings and secondary residences need to share the same electrical meter. This size of service should be large enough for everything I want to add. 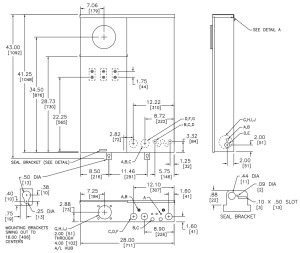 I like this particular panel because it accepts my favorite QO circuit breakers. What, you mean you don’t have a favorite type of circuit breaker? What’s wrong with you? Everybody who’s anybody has a favorite circuit breaker! Right? Doesn’t everybody? Anyway, it accepts several QO breakers and also a pair of QDL breakers up to 200 amps each. That’s important because the ridiculously thick conductors which I’ll need in order to get power all the way to the end of the property are too large for a normal breaker to clamp on to. Looks like Anthony has wasted no time in getting started removing my tree stumps. There should be some concrete by next weekend! I didn’t really do anything at the site this weekend, but I had to go up there and leave my wet-stamped plans for the inspector to look at. I had provided a copy for Anthony to work from, but the inspector will want to see the plan set that the building department stamped in red. Supposedly that proves that I’m not cheating, although if I really wanted to fake plan approval I could just have my own rubber stamp made that says “REVIEWED FOR CODE COMPLIANCE”. Anyway, everything should be ready to go now. 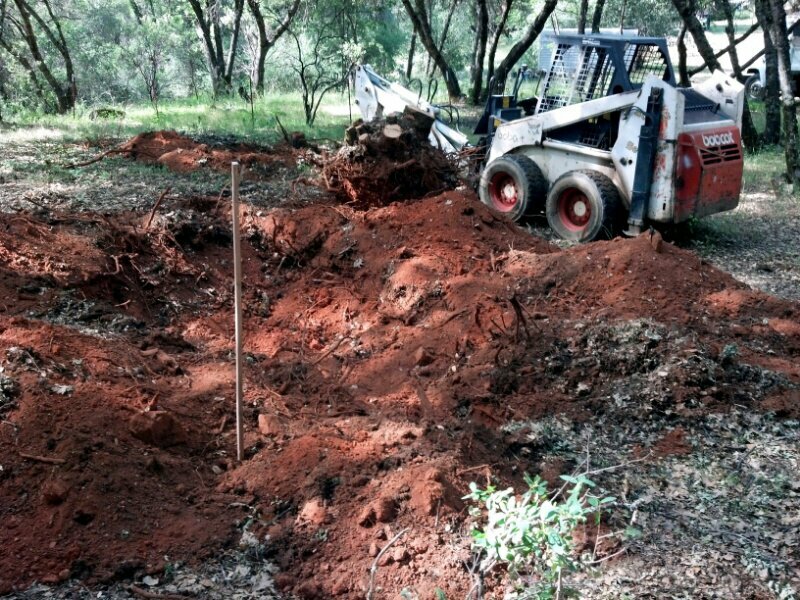 By next weekend the foundation will be well underway. Depending on how quickly things move it might even be done, although I kind of doubt that it will go that fast. 5 days seems to me like it would be a very aggressive schedule. I signed the contract with A & J Construction today for my foundation. Anthony expects to get started next week. He had previously thought he might get going this Friday, but his other job is delayed on account of the weather. I’m fine with that, I’m in no big hurry. Had to move the wood pile so that the concrete truck will be able to get in. You know something? 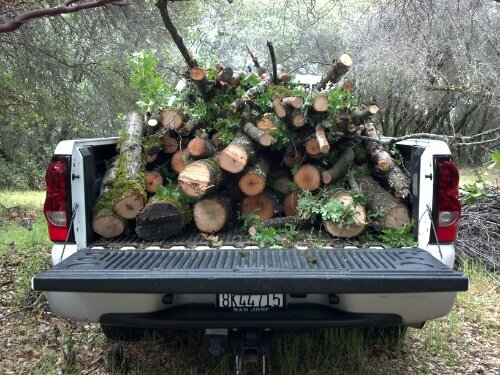 Freshly cut oak logs are surprisingly heavy. I took a few of the larger ones back to San José in case Wendy wants to use them in one of her woodworking projects. I told the neighbors that they can have the smaller stuff if they want it. 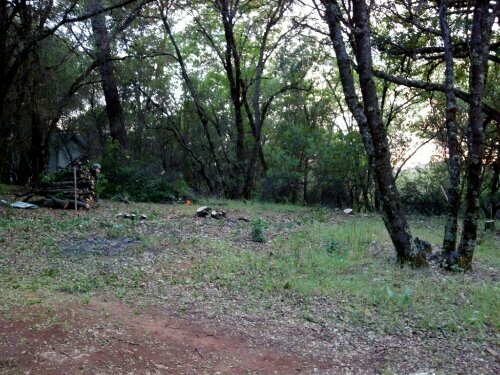 I was up in Grass Valley this weekend finishing up the site prep. I finished clearing out the scrub oaks. It should be ready for the foundation guy to start work as soon as the contract is signed. Things are finally getting rolling with my barn construction project. I’ve posted a copy of the approved plans here. I’ve selected A&J Construction to contract with for my foundation. It’s going to cost me eleven grand, but it will really simplify my life to have someone else do this for me. There’s some leeway for me to call in favors with friends and family to get my carpentry done, but there isn’t much room for error when the concrete truck arrives. I had originally planned to do the foundation myself, but it turned out to be a bit more complicated than a basic monolithic slab. The footings, stemwalls and slab are all going to be separate pours. There’s also going to be a pretty large amount of compacted gravel fill, which will have to be done in several lifts. I think I’ll be glad that I contracted this out.